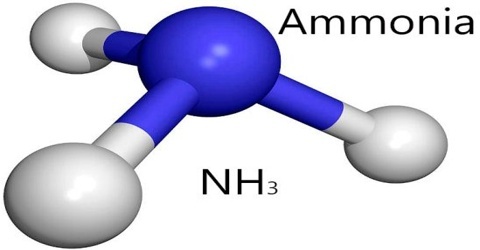 Ammonia (NH3) is a colorless alkaline gas that is lighter than air and has a strong pungent odor. It is used as a fertilizer and refrigerant, in medicine, and in making dyes, textiles, plastics, and explosives. It is also known as azane. It can take the form of a strong-smelling liquid or gas. This chemical is hazardous, and even in low concentrations, inhaling it or getting the solution on the skin can cause burning, fainting or possible death. Caution should always be used when one is handling this chemical. 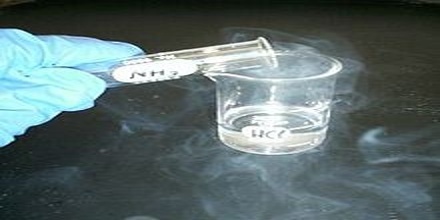 Ammonia dissolves easily in water to form ammonium hydroxide (NH4OH) and is often known in this form as ‘household ammonia’. It is commonly used for cleaning. The global industrial production of ammonia in 2014 was 176 million tonnes (173,000,000 long tons; 194,000,000 short tons), a 16% increase over the 2006 global industrial production of 152 million tonnes (150,000,000 long tons; 168,000,000 short tons). Industrial ammonia is sold either as ammonia liquor (usually 28% ammonia in water) or as pressurized or refrigerated anhydrous liquid ammonia transported in tank cars or cylinders. Ammonia is irritating to the skin, eyes, nose, throat, and lungs. Exposure to high concentrations in the air can severely burn the skin, eyes, throat, or lungs. In extreme cases, blindness, lung damage, or death can occur. Breathing lower concentrations causes coughing and nose and throat irritation. Swallowing ammonia may burn the mouth, throat, and stomach. Ammonia is one of the most abundant nitrogen-containing compounds in the atmosphere. It is an irritant with a characteristic pungent odor, which is widely used in industry. It has a pungent odor with and an alkaline or soapy taste. When inhaled suddenly, it brings tears into the eyes. It is lighter than air and is therefore collected by the downward displacement of air. It is highly soluble in water: One volume of water dissolves about 1300 volumes of ammonia gas. It is due to its high solubility in water that the gas cannot be collected over water. 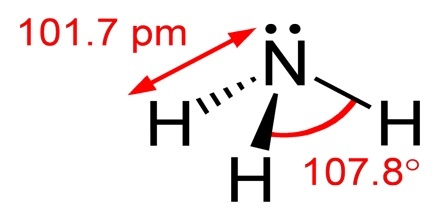 The ammonia molecule is formed due to the overlap of three sp3 hybrid orbitals and orbitals of three hydrogens. The fourth sp3 hybrid orbital is occupied by a lone-pair. This gives a trigonal pyramidal shape to ammonia molecule. Ammonia is well recognized to be central in the pathogenesis of hepatic encephalopathy and has been of importance to generations dating back to the early Egyptians. The gut produces ammonia which is metabolized in the liver and almost all organ systems are involved in ammonia metabolism. Colonic bacteria produce ammonia by splitting urea and other amino acids, however, this does not explain hyperammonemia and hepatic encephalopathy. Ammonia is easily incorporated into the water as a solution, so it is used in many cleaners. Window sprays, oven cleaning foams, toilet bowl cleaners, wax removers, and other household cleaners often contain 5 percent to 10 percent ammonia. Commercial cleansers, which often contain 25 percent to 30 percent ammonia, are extremely dangerous because they are highly corrosive. As a gas, this substance is lighter than air, so it won’t pool indoors like other dangerous gases, such as propane. 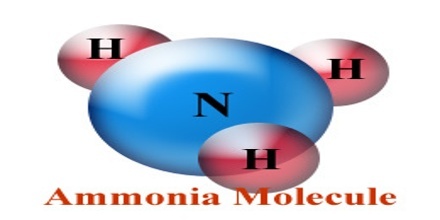 Although ammonia has a pungent, distinctive odor, it is clear and difficult to ignite unless it is highly concentrated. This makes it safer than other chemicals for household use because most people will recognize the smell and avoid touching the chemical or inhaling its fumes.